There are two possible futures that I can see for PC gaming: the first is that it goes grumbling to the grave still clutching its Razer Boomslang mouse and G19 keyboard muttering about the post -PC world. The second is that it innovates like crazy and adapts to the world that we live in, building a new empire that can compete against the likes of Xbox and PlayStation and possibly even more importantly iPads, Android tablets and phones. I'm a PC Gamer and proud to consider myself one. I have splurged ludicrous amounts of money on mouse mats to kid myself into thinking it would earn my one more AWP victim in Counter Strike. I've even built my own gaming PC and I've experimented with every gaming keyboard, gamepad and add-on over the years. And that means that I have a long term love affair with mouse and keyboard. Is the mouse in a gaming hole? But the time has come for PC gamers to accept that, if they want their platform to survive, it needs to evolve away from the desktop - and that means cutting those rugged fabric cords and looking to a new direction. 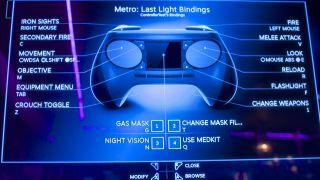 It's fairy clear that the innovators at Valve have come to the same conclusion; and I am absolutely thrilled that they have decided to take the fight to the consoles with the Linux-based Steam Machines and the Steam controller. The latter is always going to be divisive; can it really be PC gaming if it doesn't involve a mouse and keys? PC Gamer even suggests that what we really need are comfortable mouse and keys for use while sitting on our sofas. While both arguments are ones that I sympathise with, I think both have to be considered a little short-sighted. They do appreciate that gaming has become much more likely to take place in the living room rather than in bedrooms and studies, and they do speak to the pain that PC gamers might well have to go through. What they perhaps don't attribute enough importance to is that this is no longer the time for compromise and half-measures. If PC gaming wants to survive then it has to evolve quickly, and clinging on to mouse and keys might well be enough to kill that impetus. Our hands on time with the Steam controller suggests that it falls short of the truly wonderful sensitivity that the mouse and keys brings. That pinpoint accuracy and split-second reaction time that makes PC gaming every bit as skilled and difficult as professional sport. But, interestingly, it's also described as a big step on from those cumbersome clumsy console controllers that feel so much like a compromise in the hands of most PC gamers. Quite sensibly, reviewer Alex Roth concludes: "Valve's Steam Box controller is impressively precise and uniquely creative... If it catches on it could be a sea change for all gaming, not just on PCs. However, if it can't compete with the mouse and keyboard, there's no way it'll become the standard for head-to-head online games like StarCraft II and Counter-Strike." I think that the truth is that, whether it is the Steam controller or something beyond, PC gaming cannot pretend that using the mouse in the living room is ever going to be prove to be a viable option, as much as so many of us wish it was. The only way that PC gaming can survive and flourish, in my honest opinion, is to look beyond the past and come up with a new living room-friendly way. I've held off buying a console in this generation because I want to either buy or, time permitting, build myself a Steam Machine and I'm hopeful that the tinkering that Valve still wants to do with the controller can take it a step closer to the accuracy and speed of older control mechanisms. And I'll be bearing in mind that a flourishing world of Steam Machines might well even give the world of PC gaming on desktops a new lease of life, giving us the best of both worlds. Now where's the sticky tape?